With that, they make a lot of great looking and well designed packs – the Arc’Teryx Astri, the Arc’Teryx Blade 28 and the Arc’Teryx Covert Case, just to name a few. What’s so special about the Veilance Line? The Veilance line is a sub-brand of Arcteryx with a focus on urban and minimalist aesthetics. Basically, Arc’Teryx have taken their decades of experience making gear for some of the harshest environments on Earth, and designing products that can blend-in in an urban environment. For example, you won’t see the famous Arcteryx logo emblazoned on the outside of any Veilance product. I don’t know about you, but that philosophy is right up my alley. You’re basically getting all the technical features of outdoor gear without the large, obnoxious branding like you typically see in North Face or Columbia outerwear and luggage. 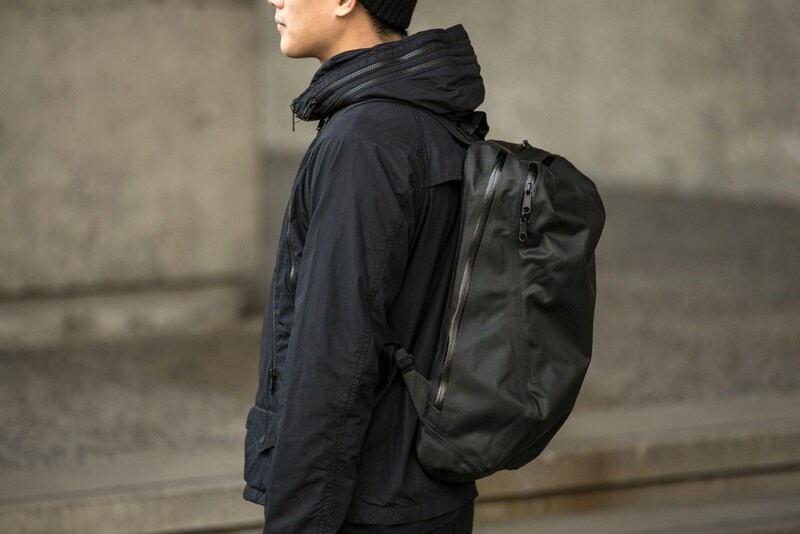 And unlike some mainline Arcteryx products, all Veilance products as of today are still designed and manufactured in Vancouver, Canada. 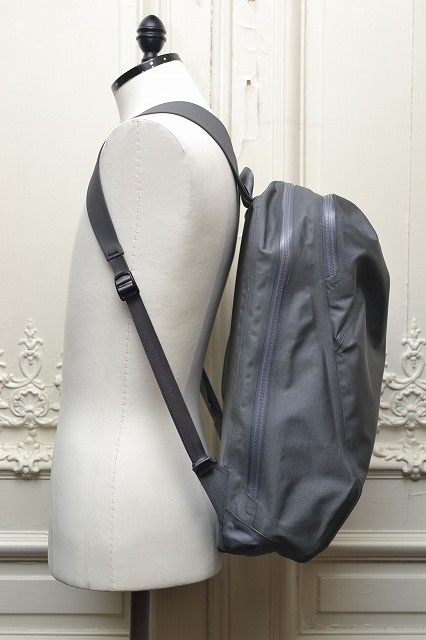 The Nomin backpack is one of two carry options currently available in the Veilance line (the other being the Seque tote bag). 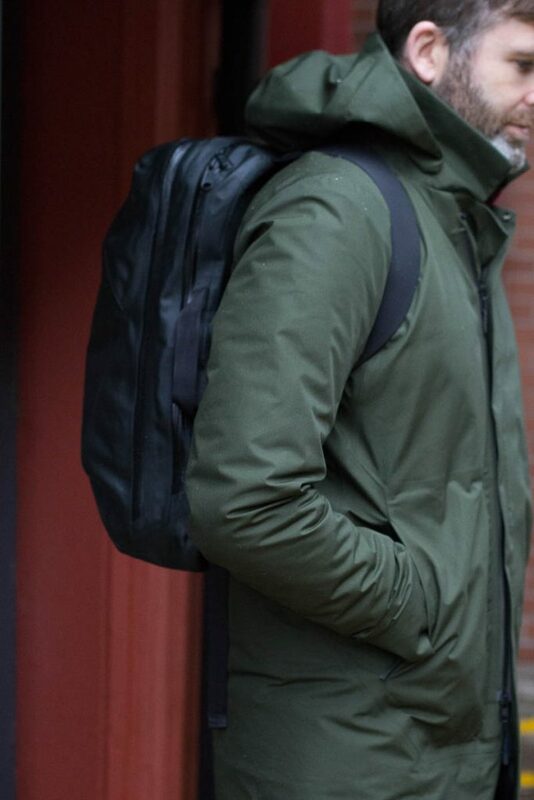 The Nomin pack screams urban through and through. This is an extremely well built, very stealthy looking pack, designed for everyday carry. It’s made of coated lightweight ripstop nylon with water resistant zips, and the straps use the same ultra strong, yet light material used in Arc’teryx’s climbing harnesses. 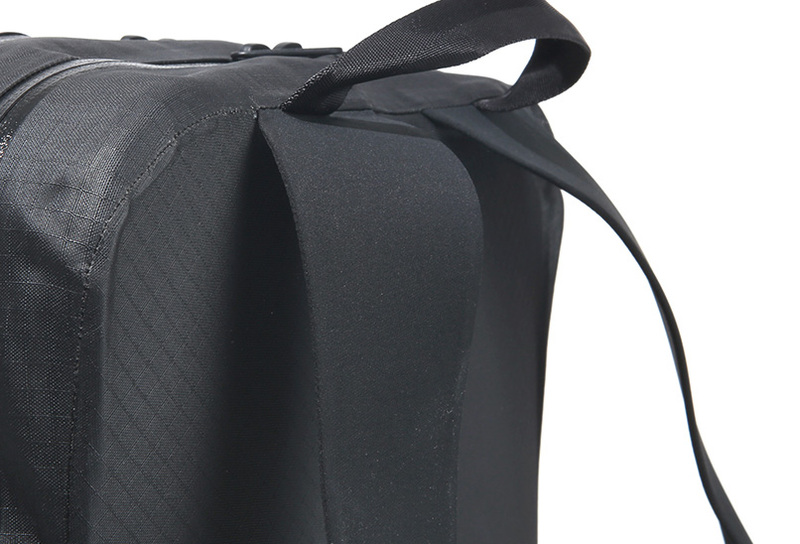 The straps might look flimsy, but they’re actually one of the toughest things on this bag. 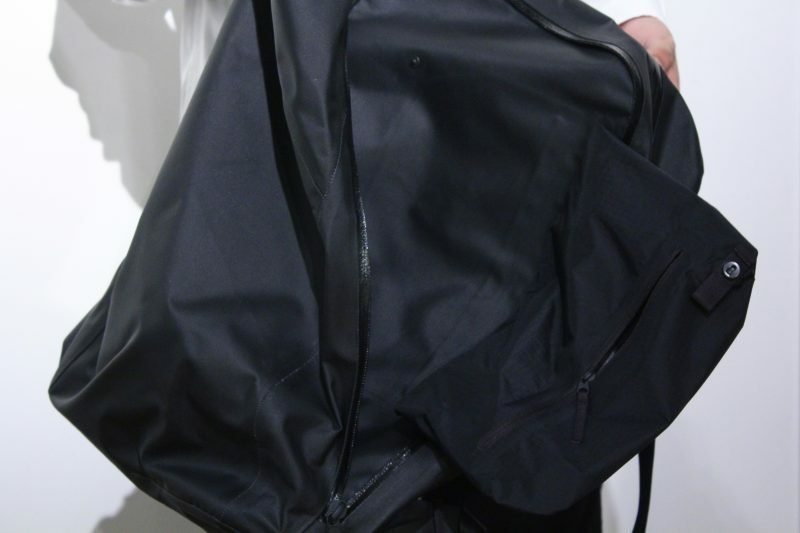 The exterior of the bag is water resistant coated nylon, and it can really take a beating without evidence of wear. Measuring around 19″ x 12″ x 5″, with a 26 liter capacity, the Nomin is perfect for everyday use. Not too small that you won’t have enough space if you decide to do some last-minute shopping at the end of the day, but it’s not too big and unwieldy to carry around in a crowded subway. The minimal depth of the bag helps too, even fully packed, you won’t like like a ninja turtle. 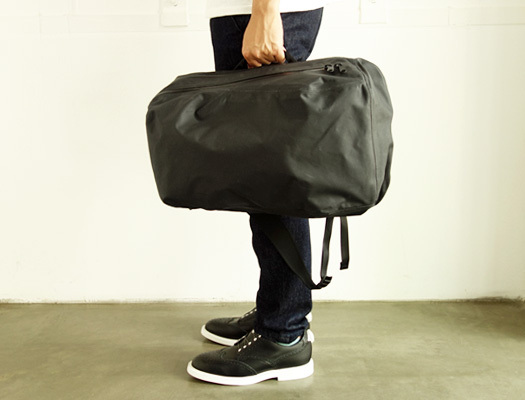 Because it has slightly more capacity than your typical 21L EDC bag, the Nomin is also perfectly sized for ultralight onebag travelers. The lack of any external branding is also a big plus for minimalist travelers and for those who don’t like to draw too much attention to themselves or their gear when traveling. The Nomin pack has two compartments. 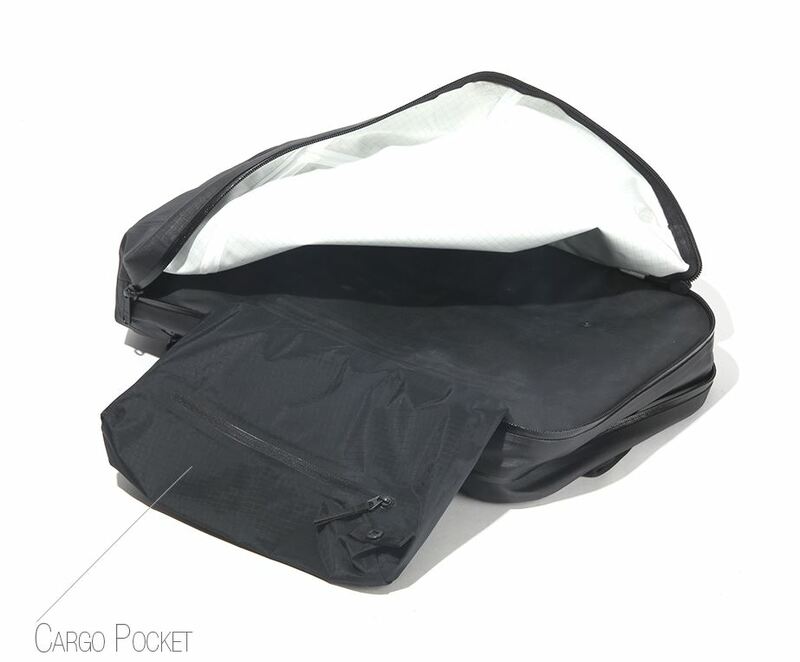 The front compartment includes an internal “floating pocket”. You can pull this pocket out for quick access without completely taking the pack off. 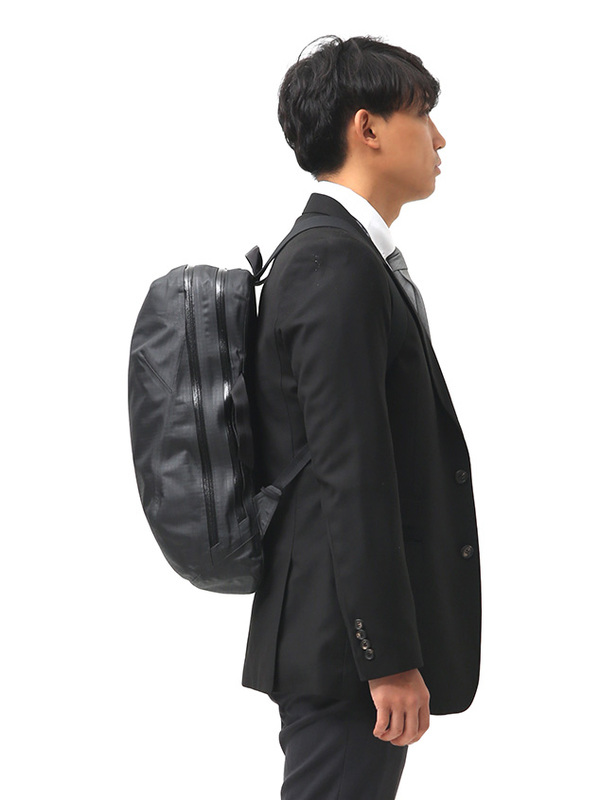 Just do the normal one shoulder backpack swing, and once you have the pack oriented horizontally in front of you (while still having the other strap slung on one shoulder), you can easily pull out the pocket for quick and easy access. 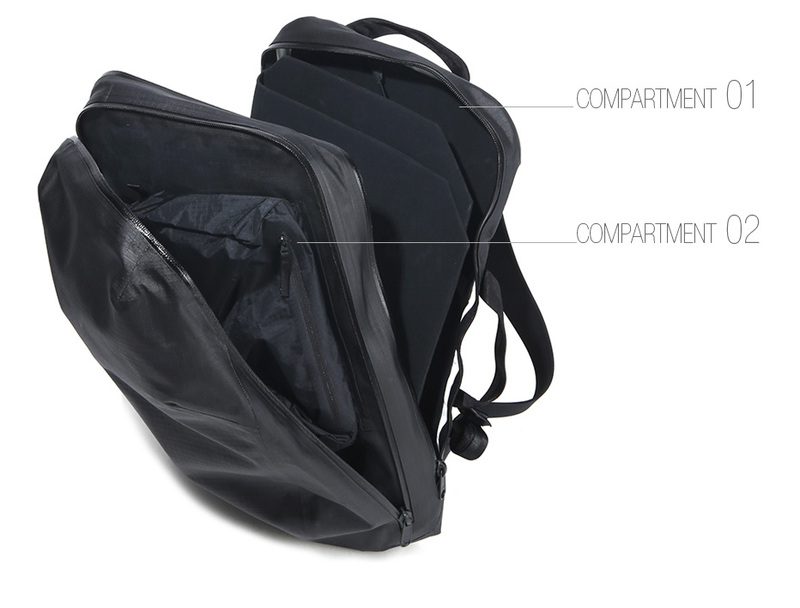 The second larger compartment (closest to the back) features a weird (but removable) laptop and document divider, with bungee cords meant to keep your laptop and documents secure. Personally, I’m not a fan of this holder. 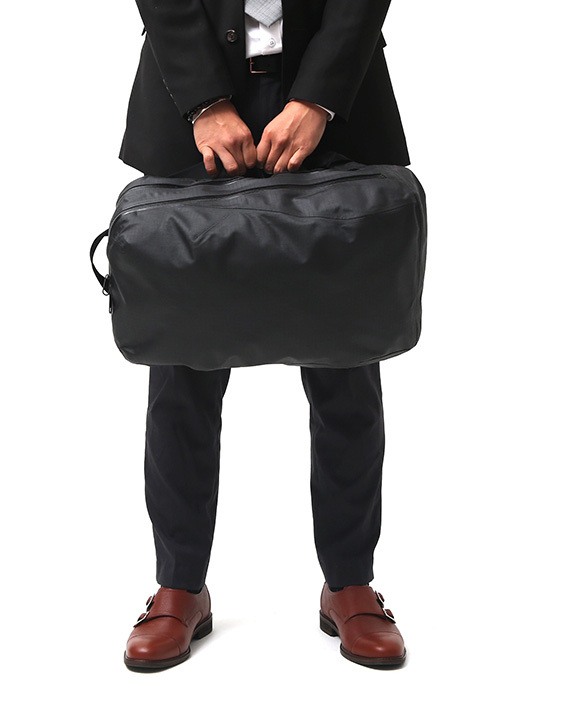 It’s probably useful if you’re the type to carry a laptop AND lots of documents or folders, but if you’re just carrying a laptop, it’s just way too big. You can probably fit two Macbooks on the slot holder. I prefer taking it out completely, and using a third-party sleeve for my laptop. 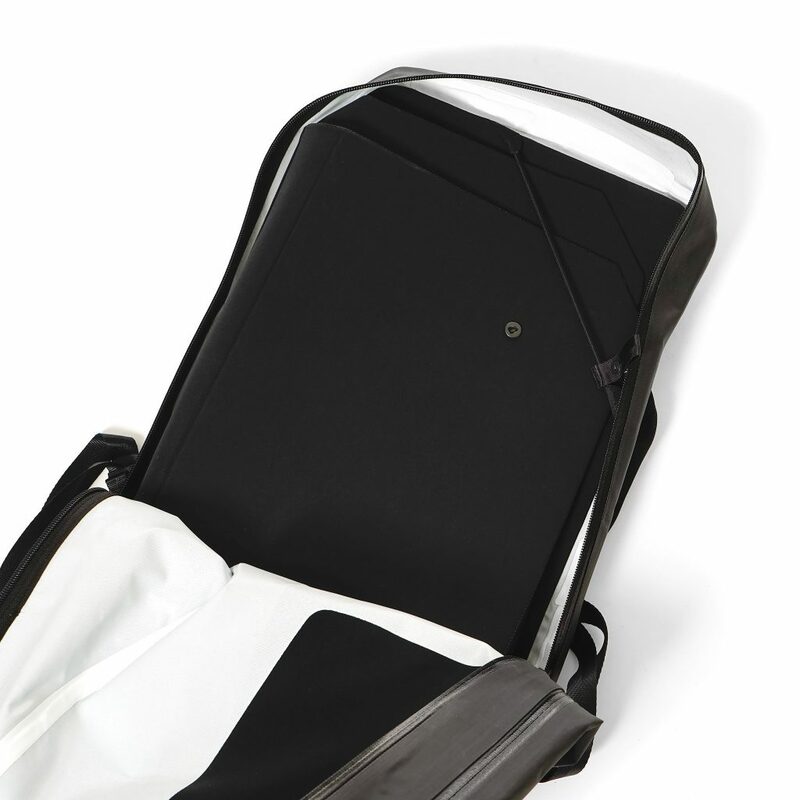 Unlike most packs, the Nomin also features two side carry handles. There’s a nice top carry handle, and a side carry handle on the right side of the bag (for briefcase style carry). 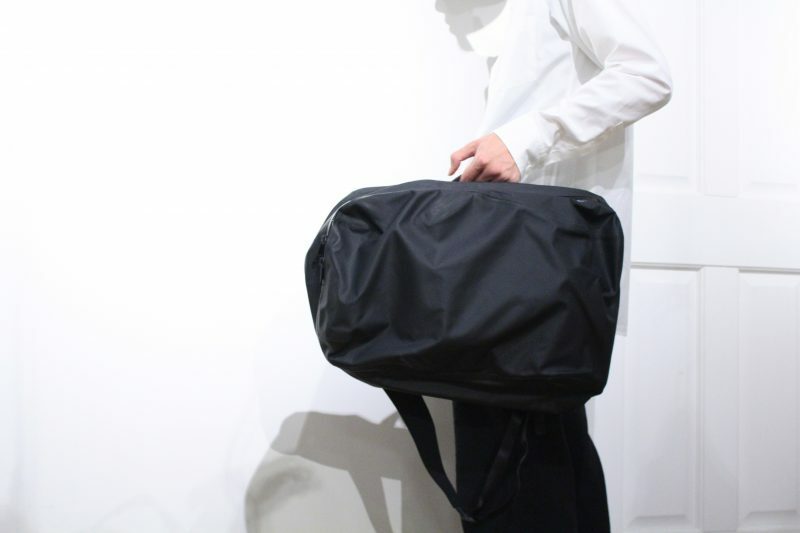 These are really useful as given its minimalist design and very understated looks, this bag will have no problems fitting in in most office environments. 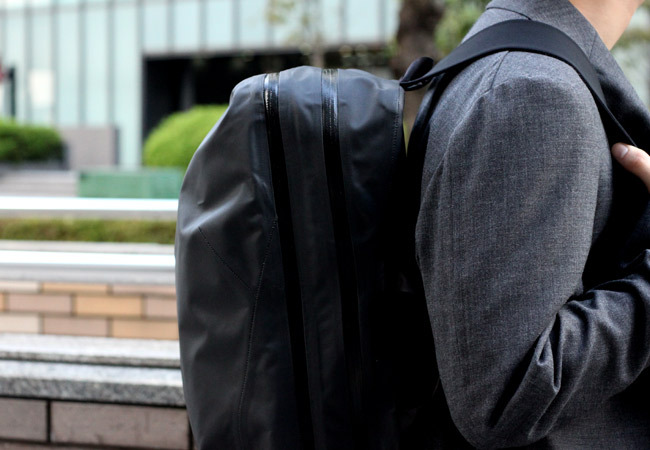 No, don’t worry, it looks absolutely nothing like the crappy nylon laptop backpacks being toted around by everyone at work, and it doesn’t look like something you would find in a university campus or a hipster coffee shop either. 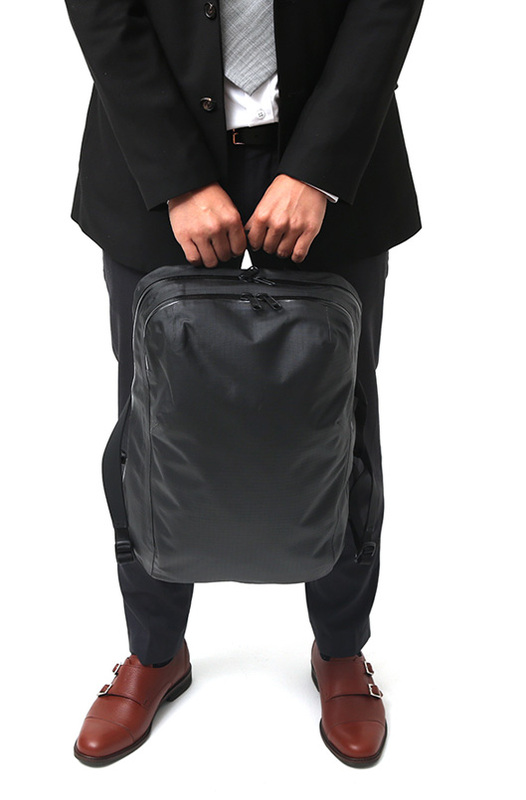 This is a bag that’s understated, professional and urban. Not a combination that you can find in most backpacks. Briefcase carry with the side handle. It pairs well with a suit too. You can’t say that for many backpacks. It’s currently available in two colorways – black and ash, which is like a light greyish-blueish color. It’s really nice, but I still prefer the all-black. 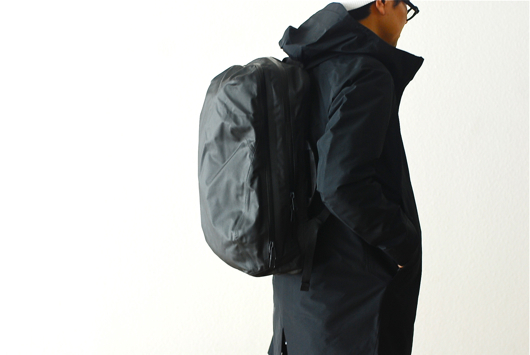 The Veilance Pack in the ash colorway. 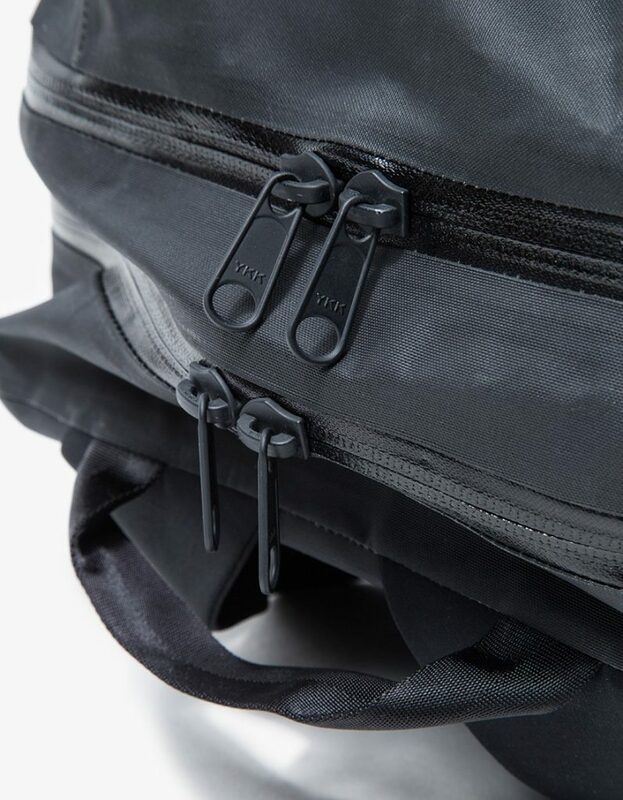 The zippers are YKK watertight zippers, and the pack features taped seams all through out. 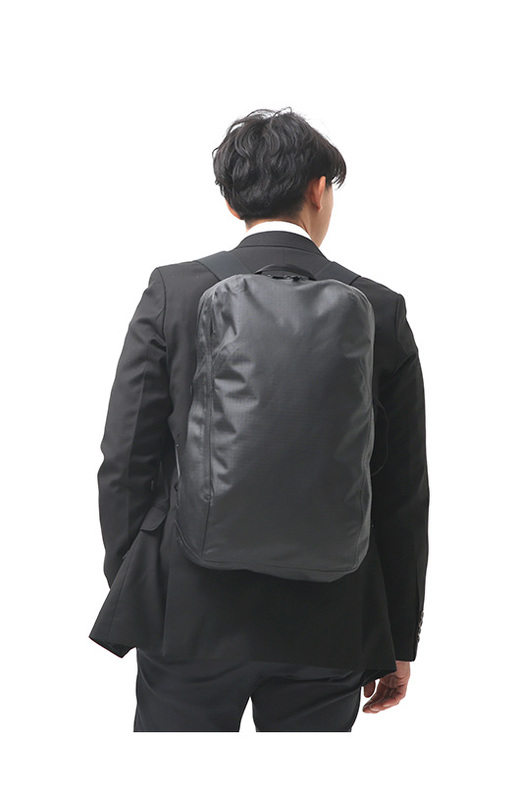 This is a backpack that you can easily carry under heavy rain. You’ll be wet to the bone before this bag lets water through. It’s not waterproof, meaning you can’t dunk it in the pool and you can’t go jump in the ocean with it, but it is extremely water resistant. The straps are also nothing short of amazing. When you first see them, you’re likely thinking there’s no way this thing is going to be comfortable for heavy loads. But they are surprisingly really good. They distribute weight really well and are not bulky at all. They’re made of the same material as Arc’Teryx’s climbing harnesses, so they are ultra tough, but they’re also relatively thin, which greatly cuts down on bulk. The bag itself weighs just under 700g when empty, and even when loaded with everyday carry, it just doesn’t feel too heavy or unwieldy. The straps are really low profile, there are no loops or sternum straps here. For a pack this size, and this light, I don’t mind that. For a pack this size, I’d rather have low profile straps than a chest strap or molle loops. The less people notice shoulder straps, the better. The outer material is ultra tough, and whatever they’re doing to it or coating it with, it really works well. This is one of the most abrasion resistant packs I’ve ever seen. And I don’t say that lightly. This is a pack that you don’t need to baby. The material is also great on clothing. 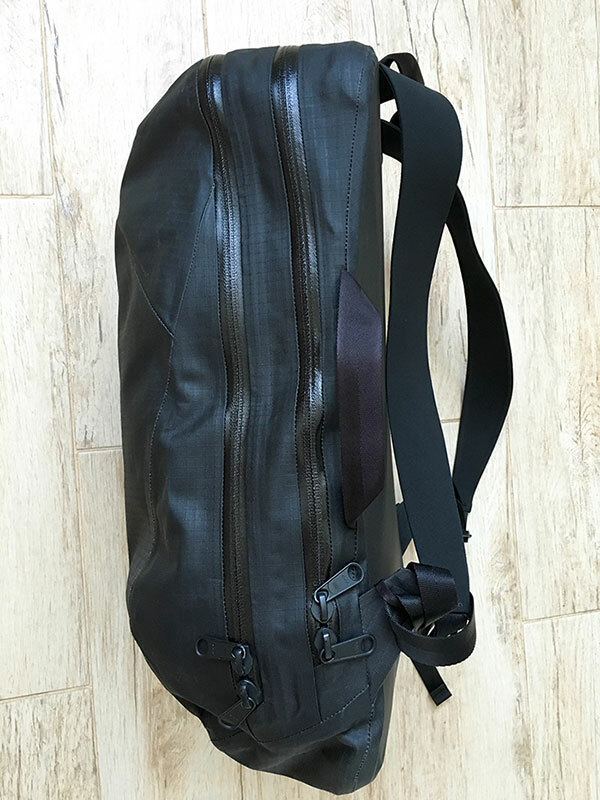 If you’ve ever tried out any of today’s “ultratough” bags made of 1000D cordura (e.g. GoRuck) you’ll notice that they aren’t very gentle on clothing. This can be a real problem if you own lots of merino wool clothing, or expensive outerwear because some bag materials will cause some pilling to occur on clothing. The water-resistant nylon outerface of the Nomin has presented no problems for me. I’ve worn it with merino shirts, dress shirts and all kinds of outwear with no problems. New updated version on the way? There are rumors that Arc’Teryx might be updating the Nomin pack for Fall/Winter 2017. Rumors are that the updated Nomin Pack will have the side carry handle will be removed, so no more briefcase carry option. Not sure I’m happy about that honestly. But you do still get the top carry handle. 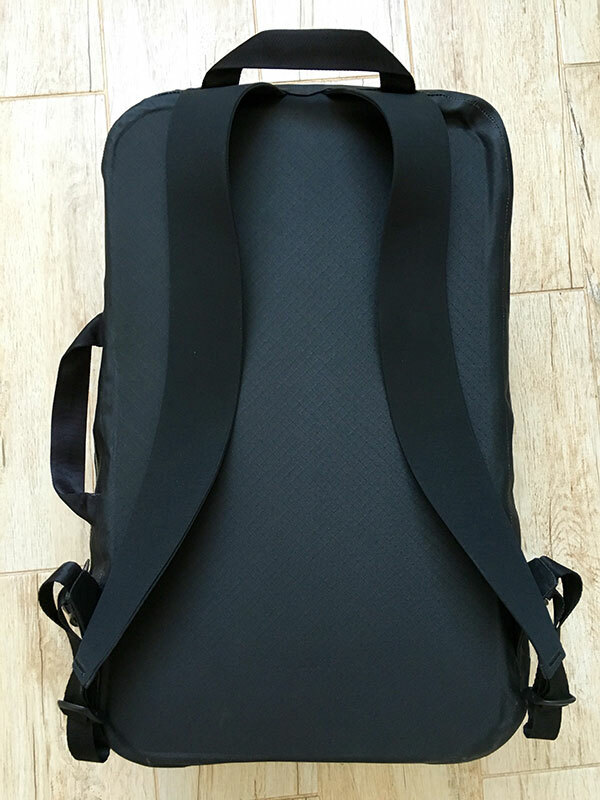 The new Nomin pack will also supposedly change the orientation of the internal floating pocket – it will no longer open horizontally, but will open to the top, like most backpack pockets. Not sure I’m happy about this rumored change either – this means you can’t really access it easily using the one shoulder swing. But the new design means it’s easier to access the pocket while the pack is off your back and standing upright. The biggest rumored change is that the capacity of the two compartments are now reversed. The front compartment is now larger than the back, and the back compartment is now better designed to be a laptop only compartment. The old laptop and document holder is now gone (yey!) and there are supposedly some magnets to help with keeping things in place. Oh, and yeah, rumors also say there might be a price hike too. But right now, those are all just rumors. We’ll just have to wait and see once the F/W 2017 collection drops. It might even come later in 2018, who knows? Personally, I’m not sure I’m a fan of the rumored redesign – I do like the change in the laptop compartment, but the loss of the side handle and the change in the orientation of the floating pocket isn’t enough to offset the advantages of the better laptop carry, for me. At an SRP of USD $700, and a street price of around USD $500, the Nomin is certainly a grail item. But if you’re in the market for a discreet looking, ultralight, yet ultra tough pack that can handle both work and play, this is worth a serious look. 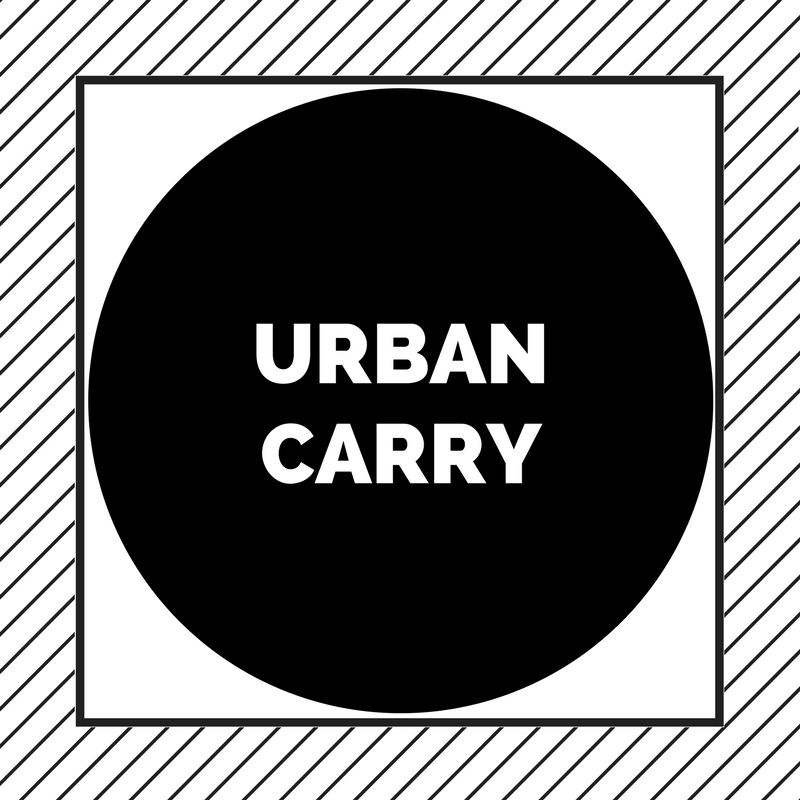 You can also check out our list of the Best Minimalist Urban Backpacks (for any budget) – right here. 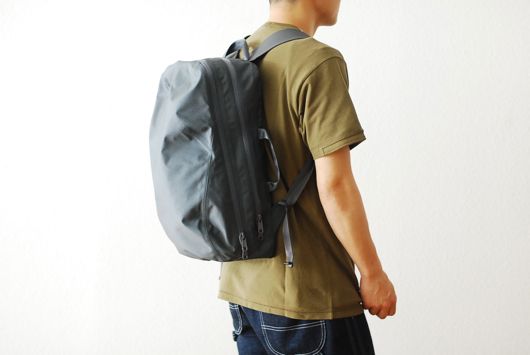 You can shop the Nomin Pack on Haven. Next Post Best Gym Bags for any workout in 2017!